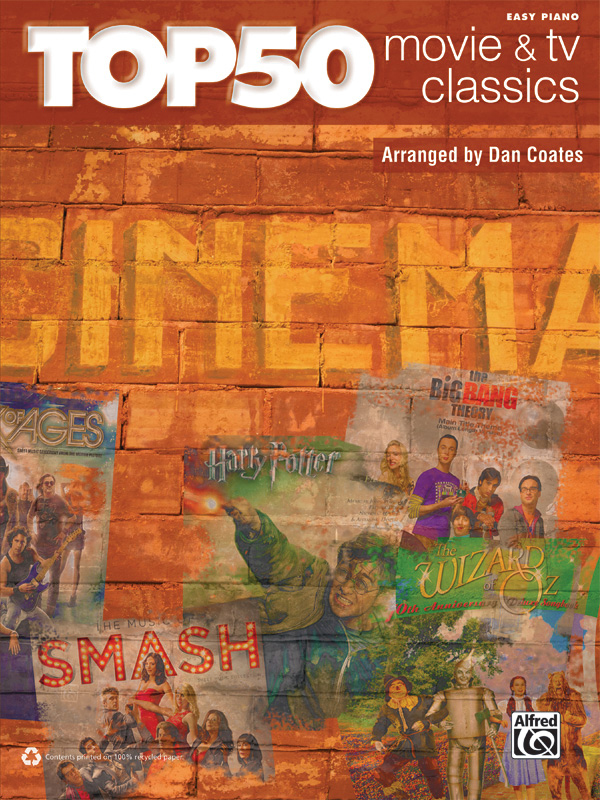 * Renowned pop piano arranger Dan Coates presents a fun collection of 50 easy piano arrangements of famous themes and songs from blockbuster movies and television series. * Featured are epic themes by world-class film composers like Howard Shore (The Lord of the Rings Trilogy), John Williams (Star Wars, Harry Potter, etc. ), Hans Zimmer (Inception, Sherlock Holmes, etc. ), and more. * Beloved songs from TV and the movies throughout the ages are also included. * Titles: As Time Goes By (Casablanca), The Ballad of Gilligan's Isle, Batman Theme, The Big Bang Theory (Main Title Theme), Can You Feel the Love Tonight (The Lion King), Cantina Band (Star Wars Episode IV: A New Hope), Colors of the Wind (Pocahontas), Concerning Hobbits (The Lord of the Rings: The Fellowship of the Ring), Corpse Bride (Main Title), Dancing Queen (Mamma Mia! ), The Dark Knight Overture, Discombobulate (Sherlock Holmes), Don't Forget Me (SMASH), Don't Rain on My Parade (Funny Girl / Glee), Don't Stop Believin' (Rock of Ages), Dream Is Collapsing (Inception), Falling Slowly (Once), Harry's Wondrous World (Harry Potter and the Sorcerer's Stone), Hedwig's Theme (Harry Potter and the Sorcerer's Stone), I Could Have Danced All Night (My Fair Lady), I Don't Want to Miss a Thing (Armageddon), I Have Nothing (The Bodyguard), I'll Be There for You (Friends), The Imperial March (Star Wars Episode V: The Empire Strikes Back), Into the West (The Lord of the Rings: The Return of the King), It Will Rain (The Twilight Saga: Breaking Dawn Part 1), The James Bond Theme, Let Me Be Your Star (SMASH), Lily's Theme (Harry Potter and the Deathly Hallows - Part 2), Song from M*A*S*H (Suicide Is Painless), Movin' on Up (The Jeffersons), Theme from New York, New York, The Notebook (Main Title), Out Here on My Own (Fame), Over the Rainbow (The Wizard of Oz), Part of Your World (The Little Mermaid), The Pink Panther, Princess Leia's Theme (Star Wars Episode IV: A New Hope), Raiders March (Raiders of the Lost Ark), The Rose, Secondhand White Baby Grand (SMASH), Singin' in the Rain, Star Wars (MainTitle), Stayin' Alive (Saturday Night Fever), Theme from Superman, Those Were the Days (All in the Family), A Whole New World (Alladin), The Wind Beneath My Wings (Beaches), You Haven't Seen the Last of Me (Burlesque), You've Got a Friend in Me (Toy Story).